Firefighters on scene of a lightning strike that caused smoke, but apparently no ignition of fire in a house at 1115 East Mayfair. 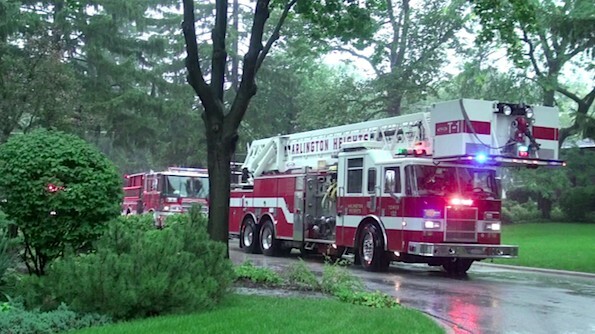 Arlington Heights firefighter/paramedics and police responded about 10:35 a.m. Saturday to a report of a possible house fire at 1115 East Mayfair Road. Firefighters received a report of smoke in the house after a possible lightning strike. The first fire unit on the scene reported nothing showing from the exterior, but firefighters inside did report light smoke. Smoke that was discovered in the attic apparently dissipated on its own. Firefighters charged their hose lines and checked the house with a thermal image camera for signs of fire, but no fire was discovered.